Everyone knows that a large part of SXSW is the parties. Sure we all go to a couple panels during the day, but the true networking happens late into the night at various venues and taco trucks around Austin. 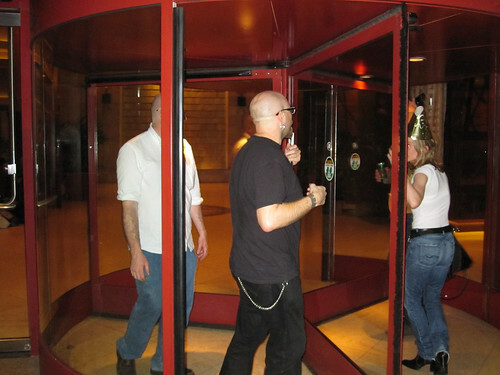 This year was no different, except for one new party: the Revolving Door Party in the Hilton Lobby. As people returned to the Hilton after last call on Sunday night, they were invited to don a party hat and take a dance around the revolving door of the Austin Hilton. Some people took one quick turn, while others spent quite a bit of time dancing round and round. One of the organizers, @efng spent an astonishing 2 hours in the doors, keeping the party going late into the night. Another organizer was SF Shenaniganist Nelz, who handed out hats and noisemakers. I worked “the door” for awhile checking IDs. Foursquare and Gowalla checkins plus multiple tweets drew people to the Revolving Door Party and the after party in the lobby. That’s how Robert Scoble heard about it. He got out of bed to come partake in the fun and ended up springing for pizza for everyone. LA Weekly’s Shannon Cottreell has some photos and Chuck Reynolds takes us on a video tour of the party. I also snapped a few pics and video.